Sept. 1, 2012—the skin, the blood, and the lining of the gut—adult stem cells replenish them daily. But stem cells really show off their healing powers in planarians, humble flatworms fabled for their ability to rebuild any missing body part. Just how adult stem cells build the right tissues at the right times and places has remained largely unanswered. 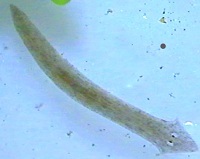 For the new study, first author Otto C. Guedelhoefer, IV, Ph.D., a former graduate student in Sánchez Alvarado's lab, exposed S. mediterranea to radiation, which killed the worms' neoblasts while leaving other types of cells unharmed. The irradiated worms would wither and die within weeks unless Guedelhoefer transplanted some stem cells from another worm. The graft's stem cells sensed the presence of a wound—the transplant site—migrated out of the graft, reproduced and rescued their host. Unlike adult stem cells in humans and other mammals, planarian stem cells remain pluripotent in fully mature animals and remain so even as they migrate.